Figure 5-8. Effects of nonstandard pressure on an altimeter of an aircraft flown into air of lower than standard pressure (air is less dense). It is not sufficient in the airspace system for only the pilot to have an indication of the aircraft’s altitude; the air traffic controller on the ground must also know the altitude of the aircraft. To provide this information, the aircraft is typically equipped with an encoding altimeter. When the ATC transponder is set to Mode C, the encoding altimeter supplies the transponder with a series of pulses identifying the flight level (in increments of 100 feet) at which the aircraft is flying. This series of pulses is transmitted to the ground radar where they appear on the controller’s scope as an alphanumeric display around the return for the aircraft. The transponder allows the ground controller to identify the aircraft and determine the pressure altitude at which it is flying. A computer inside the encoding altimeter measures the pressure referenced from 29.92 “Hg and delivers this data to the transponder. When the pilot adjusts the barometric scale to the local altimeter setting, the data sent to the transponder is not affected. This is to ensure that all Mode C aircraft are transmitting data referenced to a common pressure level. ATC equipment adjusts the displayed altitudes to compensate for local pressure differences allowing display of targets at correct altitudes. 14 CFR part 91 requires the altitude transmitted by the transponder to be within 125 feet of the altitude indicated on the instrument used to maintain flight altitude. Below 31,000 feet, a 1,000 foot separation is the minimum required between usable flight levels. Flight levels (FLs) generally start at 18,000 feet where the local pressure is 29.92 “Hg or greater. All aircraft 18,000 feet and above use a standard altimeter setting of 29.92 “Hg, and the altitudes are in reference to a standard hence termed FL. Between FL 180 and FL 290, the minimum altitude separation is 1,000 feet between aircraft. However, for flight above FL 290 (primarily due to aircraft equipage and reporting capability; potential error) ATC applied the requirement of 2,000 feet of separation. FL 290, an altitude appropriate for an eastbound aircraft, would be followed by FL 310 for a westbound aircraft, and so on to FL 410, or seven FLs available for flight. With 1,000-foot separation, or a reduction of the vertical separation between FL 290 and FL 410, an additional six FLs become available. This results in normal flight level and direction management being maintained from FL 180 through FL 410. Hence the name is Reduced Vertical Separation Minimum (RVSM). Because it is applied domestically, it is called United States Domestic Reduced Vertical Separation Minimum (DRVSM). However, there is a cost to participate in the DRVSM program which relates to both aircraft equipage and pilot training. For example, altimetry error must be reduced significantly and operators using RVSM must receive authorization from the appropriate civil aviation authority. RVSM aircraft must meet required altitude-keeping performance standards. Additionally, operators must operate in accordance with RVSM policies/ procedures applicable to the airspace where they are flying. 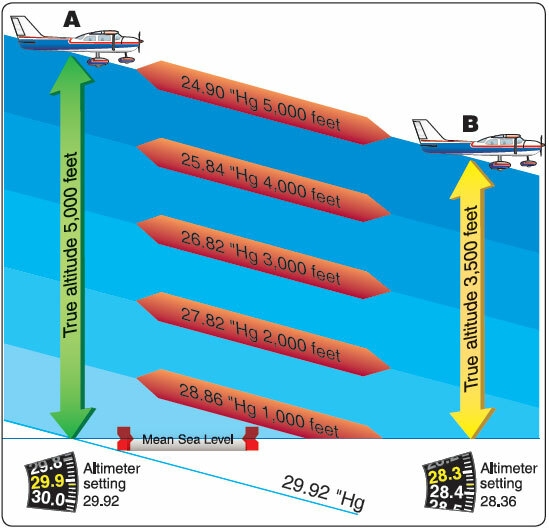 Within a tolerance band of ±65 feet about an acquired altitude when the aircraft is operated in straight-andlevel flight. Within a tolerance band of ±130 feet under no turbulent, conditions for aircraft for which application for type certification occurred on or before April 9, 1997 that are equipped with an automatic altitude control system with flight management/performance system inputs. That aircraft must be equipped with an altitude alert system that signals an alert when the altitude displayed to the flight crew deviates from the selected altitude by more than (in most cases) 200 feet. For each condition in the full RVSM flight envelope, the largest combined absolute value for residual static source error plus the avionics error may not exceed 200 feet. Aircraft with TCAS must have compatibility with RVSM Operations. 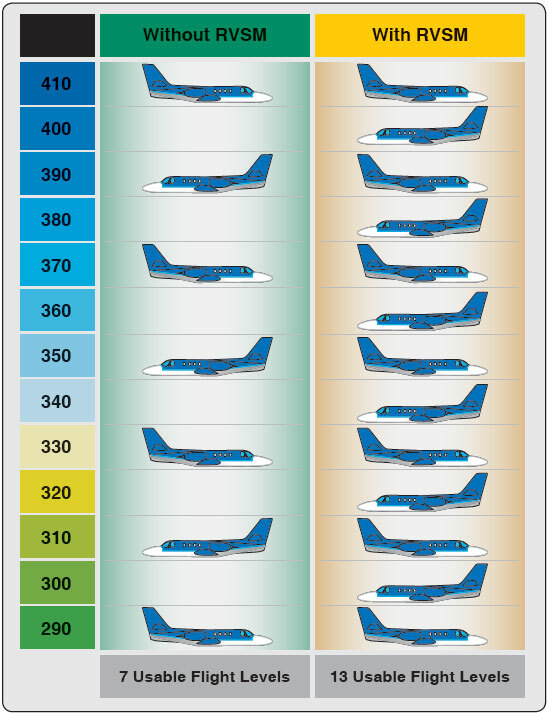 Figure 5-9 illustrates the increase in aircraft permitted between FL 180 and FL 410. Most noteworthy, however, is the economization that aircraft can take advantage of by the higher FLs being available to more aircraft. Figure 5-9. Increase in aircraft permitted between FL 180 and FL 410. 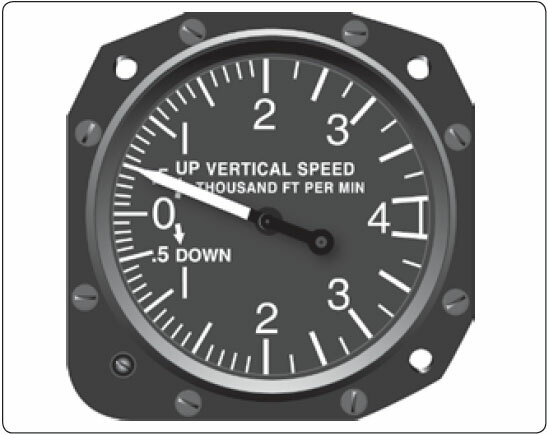 The VSI in Figure 5-10 is also called a vertical velocity indicator (VVI), and was formerly known as a rate-of-climb indicator. It is a rate-of-pressure change instrument that gives an indication of any deviation from a constant pressure level. Inside the instrument case is an aneroid very much like the one in an ASI. Both the inside of this aneroid and the inside of the instrument case are vented to the static system, but the case is vented through a calibrated orifice that causes the pressure inside the case to change more slowly than the pressure inside the aneroid. As the aircraft ascends, the static pressure becomes lower. The pressure inside the case compresses the aneroid, moving the pointer upward, showing a climb and indicating the rate of ascent in number of feet per minute (fpm). When the aircraft levels off, the pressure no longer changes. The pressure inside the case becomes equal to that inside the aneroid, and the pointer returns to its horizontal, or zero, position. When the aircraft descends, the static pressure increases. The aneroid expands, moving the pointer downward, indicating a descent. The pointer indication in a VSI lags a few seconds behind the actual change in pressure. However, it is more sensitive than an altimeter and is useful in alerting the pilot of an upward or downward trend, thereby helping maintain a constant altitude. Some of the more complex VSIs, called instantaneous vertical speed indicators (IVSI), have two accelerometer-actuated air pumps that sense an upward or downward pitch of the aircraft and instantaneously create a pressure differential. By the time the pressure caused by the pitch acceleration dissipates, the altitude pressure change is effective.